Maria Kindler, 84, formerly of N Montgomery Street, Port Washington died September 26, 2003 in Arnold, California. Maria was born April 14, 1905 to Matthew and Magdeline Kilinger Hessman in Yugoslavia. She married Anton Kindler of Yugoslavia on August 10, 1931. He preceded her in death on January 11, 1965. Maria worked in the kitchen at the former St. Alphonsus Hospital in Port Washington. In 1985 she moved from Port Washington to Grafton. She enjoyed gardening, baking and needlepoint. In 1999 she moved to California to live with her daughter. She her children Ferdinand (Else Marie) Kindler of Germantown, WI, Gertrude (Ivan) Winn of Arnold, CA, Maria (Bernard) Shira of Hubertus, WI and Sr. Erica Kuppek of Germany. 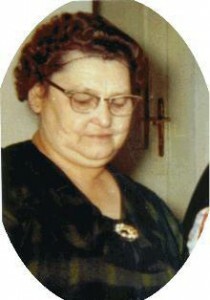 Maria was a grandmother to 8 grandchildren and 10 great grandchildren. She will be missed by other relatives and friends. Her husband, two sisters, two brothers and a grandson precede her in death. Mass of Christian Burial will be celebrated at 2:30 pm Friday, October 3, 2003 at St. Mary’s Church, 430 Johnson Street, Port Washington. The Rev. Allan Sommer will be celebrant. Interment parish cemetery. Visitation after 12:30 pm Friday AT CHURCH.